The creation of the newest merging ski zone Andermatt-Sedrun SkiArena, which is going to be opened in 2016, will bring lots of new in Swiss ski sport and in the Alpine region as a whole. The renovated infrastructure of the region promises to impress their guests. A new 5* deluxe hotel «The Chedi Andermatt» has already become a real embellishment of Andermatt ski resort and we suppose of a whole region. This hotel is definitely worth to be noted due to its exquisite charm, perfect location and service which take into account every guest’s wishes individually! Susanne Hunold – Sales and Marketing coordinator of «The Chedi Andermatt 5*» has kindly agreed to answer our questions made up by our Managing Director Vasily Maslov. How does the hotel set itself, what it is ready to offer and which it is going to impress their guests?! Let’s getting acquainted with it closer! V.M. : Once travelling by «Glacier Express» from St.-Moritz to Zermatt, I saw a small cozy village of Andermatt on my way. That was my first visual meeting with your resort. I can’t say that Andermatt is widely known among tourists, they know in general other Swiss resorts. 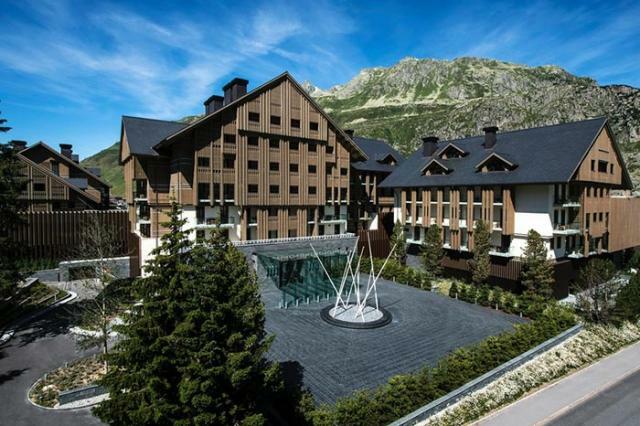 Why did GHM hotel chain stop their choice on Andermatt? S.H. : As you discovered yourself Andermatt is a small cozy village surrounded by the Alps with a lot of potential. It’s only a 2 hours’ drive away from Milano, 90 minutes to Zurich and less than 1 hour to Lucerne. Hence, the location is perfect. Moreover, we have 2 ski regions (NÄtschen and Gemsstock). These are about to be connected with a third one (Sedrun ski zone) in 2016. We will have one of the largest ski areas in Switzerland then. Also in summer this is a great location as it is surrounded by nature and ideal for sport lovers, as we offer golf, hiking, mountain biking, sailing and more. The whole region is under construction, which means there will be more well-known hotels in a few years and more holiday houses and apartments making it the perfect holiday destination in Switzerland. V.M. : Susanne, could you tell us a little about GHM hotel chain? What is the concept of hotel chain and the hotel, and who is in your target clients group? S.H. : GHM is an Asian brand GHM is an Asian brand established in 1992 (headquarter in Singapore). Each of the GHM hotels and resorts features elegant and contemporary designs interpreted with respect for the indigenous culture, rich history and unique surroundings. Authenticity is the key to every GHM guest experience: from the refined grandeur of the architecture to the respectful intimacy of addressing our guests by name. We deal with the guests who love to spend time in stylish, luxurious surroundings receiving an excellent and personalized service. Although our focus is mainly on groups of leisure, we also have a lot of enquiries from high-end businesses for business meetings, especially with the opening of our 2 meeting rooms on December 2015, which can accommodates up to 120 persons in total. V.M. : At the first time our public got to know about «Chedi» in November 2013 in Kiev at Hyatt Regency hotel, when Swiss airlines presented its flight programmes for Ukraine. And your hotel was one of the sponsors of that event. And after bright presentation of the hotel at Snow Travel Mart in St. Moritz in March 2014 I made a conclusion that your hotel can be classified as a hotel for year-round luxurious holiday and this hotel could have 6*. So, we can say about the top requirements to service. Are my assumptions correct?Whereby do you manage to maintain such a high level of service? S.H. : After Swiss rating we are a 5 star superior hotel. This can be classified as 6 stars in other countries. We are a member hotel of the Leading Hotels of the World (LHW) and therefore have to fulfil the LQA standards all the other LHW hotels have to follow as well. V.M. : Who are your guests? S.H. : The majority of our guests are Swiss who are looking to spend a short holiday in a high-end luxury hotel. However, Andermatt as a destination is developing and every day, we can see more interest from international guests. V.M. : As far hotel can satisfy all your customers’ needs? S.H. : Regarding how to satisfy our guest needs we only hire passionate people that enjoy what they are doing for others. This allows us to always go the extra step and not only satisfy our guests’ needs but also to exceed them. One example how we exceed our guests’ expectations is our ski butler team. We are the only one hotel in Switzerland that offers ski butlers to our guests. They pre-warm the ski boots; help with organizing ski tickets, ski equipment, ski lessons as well as guided tours. They are all passionate winter sport athletes and want to share their passion with our guests. V.M. : We attentively followed the first steps of the hotel in the tourism market. In October 2013 we posted on our web site your first advertising actions (The advertising actions of Swiss hotel «The Chedi Andermatt 5*» – added by N.). We’d like to know what offers and services have been in demand and popular for the last 2 years? S.H. : A true alpine playground with guaranteed snowfall and precarious peaks make Andermatt one of Europe’s finest winter sports destinations. A cable car takes skiers and snowboarders in two stages up Gemsstock Mountain to nearly 3,000 metres. Wide-open slopes and seriously deep powder here will be tested by delight experienced skiers and snowboarders alike while more leisurely slopes curve along the Gurschenalp and run gently down NÄtschen Mountain. When temperatures rise in summer time, the Urseren Valley becomes an outdoor lover’s paradise of alpine walks and mountain treks as well as opening up challenging terrain for mountain bikers and touring cyclists. Along the way expect captivating panoramas of peaks and valleys with stunning glaciers cropping up in between. Try an eco-friendly Alpmobil or an electric chargeable E-Bike to explore in silent, environmental splendor. Cross Devil’s Bridge to enter a dark and wet tunnel leading out to SchÖllenen Gorge, sure to awe even the most jaded among us. Serious daredevils will have fun feeling their heart beat faster in summertime as they navigate Via Ferrata Diavolo – a scenic and very secure fixed rope route high above the SchÖllenen Valley. Less harrowing but no less jawdropping, the Gotthard line at GÖschenen station climbs steeply up to Andermatt. Or head to Realp on the nostalgic Furka steam railway. Travel back in time by booking well in advance for a private ride over Gotthard Pass on a traditional post coach drawn by a five-horse team. For golf lovers, the 18-hole Andermatt Swiss Alps Golf Course has been harmoniously adapted to the alpine terrain. Fishing is another local summer pleasure. For our guests who wish to cast a line, «The Chedi Andermatt» can secure the appropriate permits. V.M. : The number of positive feedbacks about the hotel is amazing! And your Japanese restaurant became one of the recognized brands of the «Chedi» as the whole food system in it. Could you share the secrets of this delicate matter? S.H. : One of the most important criterions when looking for employees is their passion. Our employees must be passionate about what they do. The other criterion is knowledge. Our chefs are trained by well-known chefs and our chefs for «The Japanese» are from Japan for example. We have some of the best trained staff that worked in other luxury hotels around the globe. Hence, we can guarantee a unique excellent culinary experience and a perfect service. V.M. : Andermatt Swiss Alps organization pointed out the importance of the hotel for the resort in our last interview (Andermatt – skiing in the heart of Switzerland – added by N.). In one of the recent interview local politicians have admitted that Mr. Samih Sawiris himself and his hotel are the locomotive of Andermatt development. What does it mean? S.H. : Mr Sawiris saw the beauty and potential in this destination and started to invest in its development. Often, people are scared to try something new, go to places nobody has been before, especially when they have to travel a long way. The project really started with the building of «The Chedi Andermatt». As you can imagine to make a destination well known is a long way and does not happen overnight, especially as Andermatt is so small (1,500 habitants) and you have other prestige well-known destinations in small Switzerland, like St Moritz and Zermatt. People in Switzerland know Andermatt but we want it to be known worldwide. The opening of «The Chedi» is an important step to achieve this goal, as it is one (if not THE one) of the most beautiful hotels in Switzerland with a unique design and service. People start to become aware of «The Chedi», especially with the increasing amount of positive articles about us and the good feedbacks fromthe guests stayed with us. Also the awareness of the destination increases. People come to Andermatt to stay at «The Chedi» and they go home again having bought one of our residences for example. «The Chedi Andermatt» attracts the type of people we want and need here in Andermatt to make the destination a well-known village and a perfect holiday destination. V.M. : In March 2015 I was as a participant of a fam-trip group, which was organized by one authoritative ski tour operator and we had to stay in your hotel according the program. But, at the last moment, to everyone’s disappointment, the visit and acquaintance with the hotel were cancelled, and a whole group was accommodated in «Hotel Kameha Grand Zurich 5*». Naturally, we’d like to know how a great attention do you pay to the work with tour operators and agents. Who is in your clients’ majority – individual guests or travel companies clients? S.H. : The majority of our guests are individual travelers or guests from Switzerland. However, people around the world start to become more and more aware of «The Chedi Andermatt» and the destination as a whole. Hence, we also have more and more travel agents that want to work with us. To be successful internationally it is important to work together with travel agents. Hence, organizing FAM trips is very important to us so travel agents can understand who we are. V.M. : And at the end of our interview, could you tell us about your ambitious plans and ideas for the future. What special and extraordinary things can the hotel offer to its guests in the near future? S.H. : One of our goals is that tourists and especially luxury travellers become more aware of Andermatt as a destination.